Sometimes we see dark clouds in the sky. But if we look at them closely, we can see that their edges are sunlit white. This silver lining tells us that the sun is somewhere behind the clouds. Such clouds do not remain in the sky for a long time. They disappear quickly and the sky is clear again with the silver light of the sun. The proverb expresses the idea that sorrows and misfortunes are only temporary. Sorrows will be followed by happiness. Whenever there is shadow, light must be nearly. Whenever there is darkness, daylight is near. Behind every grief and pain, there is a silver thread of joy and happiness. Joys and sorrows are part of life. We should not lose hope in times of sorrow. The proverb teaches us to be optimistic in life. Sweet are the uses of adversity. The sorrows and calamities may be a blessing in disguise. They strengthen us to face the greater misfortunes in life boldly. Only when one goes through the difficulties of life, one becomes a complete man. Behind every calamity is hidden the message of hope. India learned a good lesson from the Indo-China war of 1962. Soon after the war, she gave more attention to modernise her defence forces. 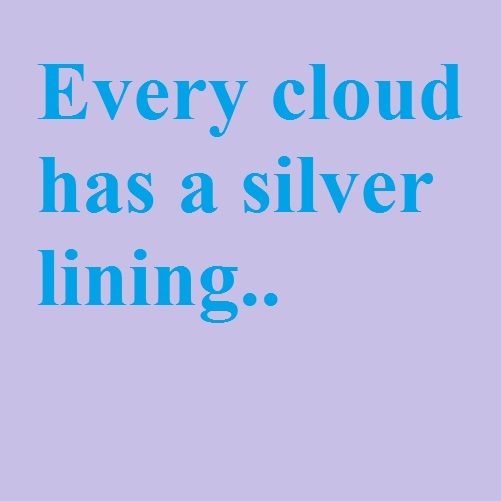 The famous English poet Shelly has expressed the same idea in his poem “Ode to the West Wind” in which he asks “If winter comes, can spring be far behind?” It is thus correctly said that every cloud has a silver lining.